Bosch was presented with the award at a ceremony held in the Royal Garden Hotel, London on Wednesday night. 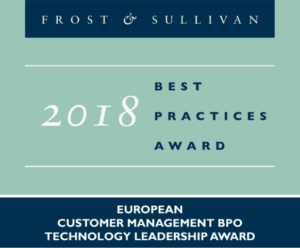 Frost & Sullivan praised the use of the company’s innovative Robotic Process Automation (RPA) solution and Artificial Intelligence (AI) in global automation. 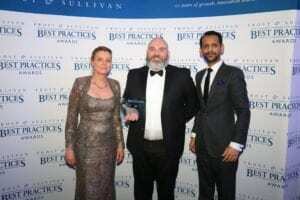 Bosh Service solutions believe that the Technology Leadership award is a testament to ther forward-looking and holistic approach in implementing automation steps in customer service and business processes. Bosch does not see automation as a threat to the business, but rather as the key to future competitiveness, stating that ‘the goal of automation is to create an ideal combination of human resources and technology. The aim is to enhance the customer experience, increase employee satisfaction, and help foster new business models. Bosch Services Solutions also uses Artificial Intelligence (AI) applications such as pattern recognition and machine learning. These enable customer concerns to be identified during an interaction with the customer advisor, and can also be used to supply associates with unsolicited information relating to a consultation. In turn, this allows the associate to focus on the customer and to address his or her concerns in an empathic way. This leads to greater satisfaction on both sides. Technology leaders are companies that promote the development and successful introduction of high-tech solutions for key problems within the sector, thus actively shaping the future of the industry. The independent analysts at Frost & Sullivan evaluated candidates’ solutions and took account of technological influences, as well as business impact. Criteria included commitment to innovation and creativity as well as operational efficiency customer acquisition and potential for growth. Other important criteria included the impact on associates and customers.